Barely five years after Louisville was founded in 1778 by George Rogers Clark, horse races were being held on Market Street. By 1805 there was racing on Shippingport “Island,” which John James Audubon frequented in 1811-1812; he noted that horse racing was almost as interesting as watching birds. After several unsuccessful attempts at organizing racetracks in Louisville, Oakland Race Course was established in 1832 on a fifty-five acre plot on the west and south sides of present day 7th Street and Magnolia Avenue. The clubhouse was celebrated as one of the most handsome sporting venues in the country, welcoming even ladies with a furnished room and private pavilion. The population of Louisville was approximately 20,000 citizens by then, only thirteen years after the death of Daniel Boone. 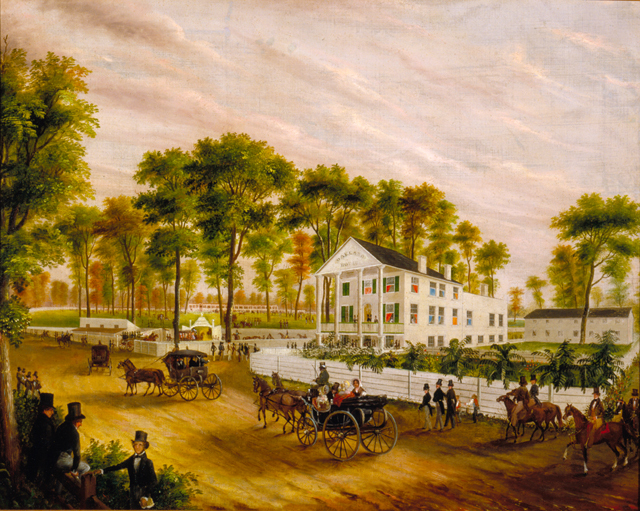 An 1840 painting of Oakland House and Race Course, Louisville, by Robert Brammer and Augustus A. Von Smith, Sr., has also graced the KOAR webpage image header since we first went online in April 2006. (See our October 2011 blog for more on Edward Fisk’s portrait of Mary Daniel.) Brammer and Von Smith had a studio together in Louisville, upstairs on the south side of the 300 block of Main Street and later at Market and Sixth Streets, during 1840-1841. Since Brammer was a landscape painter, it is assumed that he painted the famous setting, while Von Smith contributed the many “miniatures” of horses, people, and carriages. 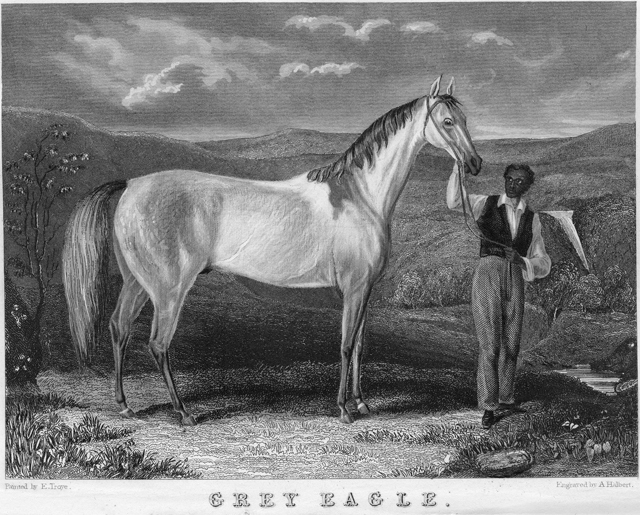 Grey Eagle, after a painting by Edward Troye, was the Embellishment (frontispiece) for the American Turf Register of April 1843. 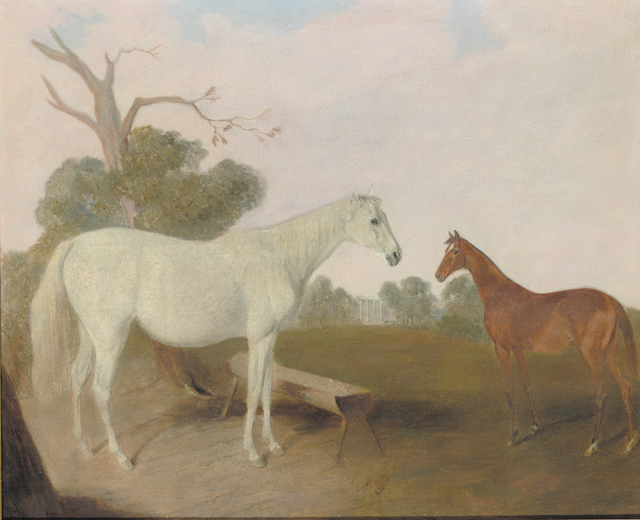 Edward Troye was a painter of race horses in Kentucky, Virginia, Ohio, and New York, being periodically active in Kentucky about 1834-1874. His portraits of renowned Early American thoroughbreds from 1832-1843 for the American Turf Register served as a marketing tool for both magazine and horseman throughout the country. They also are perhaps the only visual record of early foundation sires and mares in the United States. Troye traveled widely to sketch from life his legendary subjects, and his attention to the landscape and backgrounds behind the horses preserve a historical record of America at that time as well. This can be seen in his 1840 painting of Grey Eagle’s dam in Ophelia and Falcon, which shows in the distance Major H.T. Duncan’s Kentucky homestead, “Duncannon”, situated along Paris Pike on the outskirts of Lexington, Kentucky. For that 1839 match an estimated 10,000 people (or more) were in attendance, including hundreds of racing enthusiasts who had made the long trek across the mountains from the Atlantic seaboard. As in the Brammer and Von Smith painting, outside the clubhouse fashionable belles were helped down from fine carriages by gentlemen in top hats and tails; among the noted aristocrats on this day was a contingent from Lexington, led by Henry Clay. Less famous fans who could not afford a seat in the stands perched up in the tall, graceful oak trees that gave the track its name, hoping to catch a glimpse of the race. Wagner won the first heat; in the second, just as it seemed Grey Eagle might have a chance to win, Wagner pulled ahead and won by a nose in a record 7:44, “best time ever south of the Potomac” according to the Louisville Daily Journal. Disappointed Kentucky fans demanded a rematch, which was agreed to be run just five days later, October 5, on the same course for a purse of $10,000. This time, Grey Eagle won the first heat by a length and Wagner won the second. Grey Eagle was leading down the stretch in the in the third heat, when either he broke down from the tremendous stress or possibly was bumped by Wagner; the injury prematurely ended his racing career. Both horses became successful sires, “continuing” their matches through their offspring; in fact, Grey Eagle’s first colts started racing in 1843, the same year Troye’s portrait appeared in the American Turf Register. Cato, the famous slave jockey who had ridden Wagner, was given his freedom in exchange for the victories. And racing aficionados still consider this one of the high points of the sport in the United States. Many believe the publicity from the match races made Kentucky famous as the preeminent horse-racing state and that Louisville’s legendary Churchill Downs owes at least part of its fame to Oakland House and Race Course. However, Oakland itself suffered financial reverses in the late 1840s and was closed by the mid-1850s. It served as a staging point for Kentucky troops during the Mexican War and as a cavalry remount station for the Union Army during the Civil War. Eventually the area fell into serious disrepair and disrepute, becoming a refuge of shabby homes and gardens for society’s outcasts. At the turn of the century, Alice Hegan (Rice) dubbed the area “The Cabbage Patch” in her best-selling 1901 novel Mrs. Wiggs of the Cabbage Patch, a fictional name that has persisted to the present day. Edward Troye’s portrait of undefeated American Eclipse, a direct descendant of the undefeated eighteenth century British racing champion Eclipse, after whom the annual American Thoroughbred horse racing awards is named, is on view at The Speed Art Museum until September 23, 2012.